MALTA, NY – UCLA football coach Henry Russell “Red” Sanders” once said, “Winning isn’t everything; it’s the only thing.” (The well-known quotation is usually attributed to Green Bay Packers coach Vince Lombardi, but he got it from Sanders). But in Rich Scagliotta’s world, winning isn’t everything; the challenge is everything. The 56-year-old driver from Bound Brook, N.J., will be beginning his 22nd season of racing in 2019, and his familiar No. 8 will in the field at Albany-Saratoga Speedways on Friday nights. If winning was everything, Scagliotta would have been out of racing a long time ago. 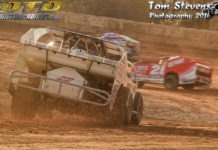 But the challenge of racing against the best dirt track drivers in the Northeast keeps him coming back year after year. Scagliotta carved out a nice, win-filled racing career when he was running sportsman in New Jersey and Delaware. He began his career in 1998 in the rookie sportsman division at New Egypt Speedway, winning the division championship in his first season. 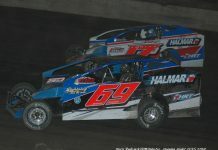 The wins kept piling up, and by 2008, he had 22 career sportsman victories in the highly competitive class, which is third on the New Egypt all-time win list for that class. But things changed in 2008. “When I was running New Egypt, we were running every week, getting $1,000 to win and were getting 50 to 60 cars,” he said recently. “Then a new promoter came in, said we were going to run every other week, and that he was going to cut the purse. So in 2009, he started making the long haul to Central New York, racing at Brewerton and Canandaigua (now Land of Legends Speedway). He got his challenge, but it came at the expense of getting victories. Since 2009, he’s only been to victory lane twice, once at Brewerton and once at Canandaigua. Both wins came during the 2011 season. “Racing in New York is different,” said Scagliotta. “You race against good people no matter where you race, but there’s something different about New York. This is the ultimate challenge. That’s why his first big block win at Brewerton in June 2011 will always be special. He passed Chuck Bower on the last lap to get that victory. Scagliotta has a unique relationship with Australian driver Peter Britten. When Britten first came to the U.S. in 2009, he worked as Scagliotta’s crew chief, but since then, they have formed a two-car team. Britten keeps the cars in his Weedsport shop, doing all the maintenance, and Scagliotta drives to New York to race. “Peter’s a great guy to learn from,” said Scagliotta. 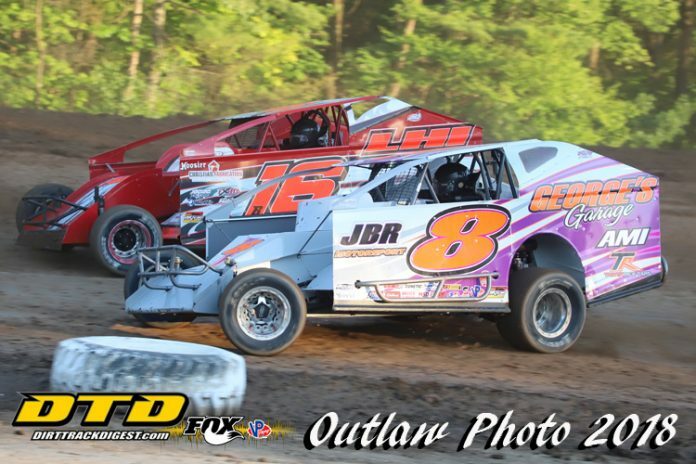 Scagliotta and Britten both began the 2018 season at Albany-Saratoga Speedway, where Scagliotta recorded a third-place finish on May 11 (matching his career-best finish at the track). But when Britten began to have back problems, they stopped racing at Malta. That was unfortunate, because Scagliotta likes racing at Albany-Saratoga, where he says he learns a lot about racing. In addition to running on Friday and Saturday nights, Scagliotta has been a regular on the Super DIRTcar big block series since 2009, when he won Rookie of the Year honors. Last year, he ran all 24 races in the series, finishing eighth in points, which tied his career-best overall finish, set in 2012. His best individual finish last season was a sixth in the Friday night big block feature at Charlotte. He started 27th in that race. As much as Scagliotta loves to race, all the travel and running his own business are starting to take a toll. “I know I’ll be racing this year, but I’m not sure how long I’m going to continue after that. It’s really becoming a grind,” Scagliotta said. If this is Scagliotta’s last season of racing, what would be sweeter than adding a couple of more wins to his list of achievements?